Timorex Gold is a new generation natural fungicide that has been marketed for banana crops for more than 3 years in Colombia with excellent results in the control of Black Sigatoka. 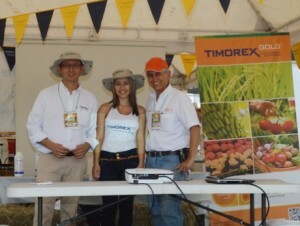 Based on these good results, a detailed report of the Colombian market and the experience that Timorex Gold has had with different cultures around the world, the Stockton Group decided, in July 2013, to consolidate operations in Colombia and expand the use of Timorex Gold to different crops in Colombia, such as tomatoes, rice, roses, etc. In June 2013, Jose Antonio Estevez was appointed Country Manager of Stockton Colombia SAS. Estevez graduated from the Javeriana University, and began his career in the crop protection industry in the market for crop protection products in Colombia, the Andean Region, Central America and the Caribbean. After acquiring an extensive experience in marketing and strategic marketing, Estevez occupied management positions at Ciba Geigy, Novartis and Syngenta.